Ecooking is a brand that you will probably have seen popping up on social media over the past month or so and that's because it's new to our shores! 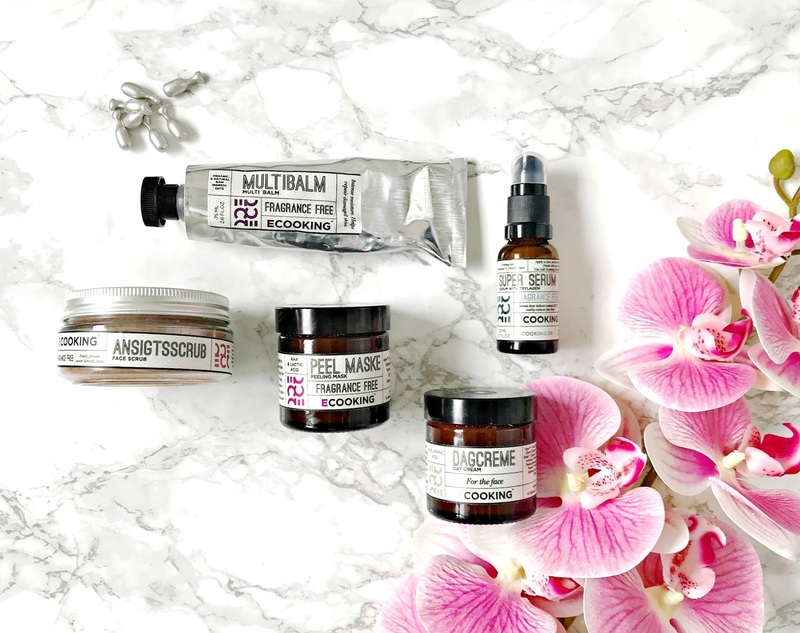 Ecooking is a Danish brand that is relatively new - it was founded in 2015 in the kitchen of Tina Søgaard whose skin had been suffering and not responding to any of her usual skincare favourites - because of this, she decided to make her own products. It is an all natural and mostly vegan brand (the exception is the beeswax used in the lip balms and multi-balm), the packaging looks quite industrial but it's recyclable and the ingredients are listed on the outside of each product. The brand has grown very quickly in its home country of Denmark and is set to be released in 20 countries worldwide before the end of 2018. There are 40 products available and I was kindly sent a selection to try and I want to share my thoughts with you today and at the end, I have a giveaway where you can win all of the products mentioned! I want to start with my favourite product from the brand - the Peeling Mask. I love a good acid product and particularly an acid mask as you can see the results quite quickly. This mask contains lactic, salicylic and glycolic acids so it gives the skin a deep pore cleanse as well as a polish. It is a very potent and active mask - the directions say to leave it on for 4-6 minutes initially and you can build up to 10-12 minutes when you have been using it for a while and I highly recommend sticking to that advice. My skin is very well accustomed to acid products and it is left quite red after using this mask although I can now leave it on for 10 minutes. My skin isn't burnt or uncomfortable but looks alarming - I always follow with a mist, hydrating serum and oil or moisturiser to balance my skin. This mask leaves the skin feeling baby soft and smooth with refined pores and a glow. I use it once weekly and can see this being a permanent fixture in my skincare cabinet. £37. There are four serums available and the one I have is the Moisurizing Serum. Packed with hyaluronic acid, my dry skin loves this serum. It absorbs quickly and skin looks plump and glowing and feels soft to touch. At £43, it isn't the cheapest serum on the market but like I said in this post, I believe that it's worth investing in serums over moisturisers. The Face Scrub is a product that I only use occasionally, purely because my personal preference is chemical exfoliation but every now and then it is nice to actually use a physical scrub as skin is always left soft and smooth and the feeling of removing dead skin is satisfying. This scrub combines shea butter with almond and sunflower oils and ground almond seeds. Usually my skin reacts very badly to shea butter but moreso when it is in a moisturiser rather than a wash off product. That being said, I personally wouldn't risk using this scrub too often because of my skin's sensitivity. Shea butter is actually very moisturising so don't let that put you off unless you have a reaction like mine. The ground almond seeds are gentle enough to buff the skin without tearing it but effective enough to leave it feeling smooth. £23. Unfortunately (for me) the Day Cream also contains shea butter so I can't use it but I passed it on to my mother who has been asking me to stroke her face to feel how soft it is! She loves the moisturiser and says that it feels nourishing on the skin but not greasy and her foundation applies very evenly over it. £32. The Multi Balm is another product that contains shea butter so I can't use it on my face but the skin on my body has no problem with shea butter so I have been using this on my elbows, ankles, cuticles - basically any stubborn dry areas and it does a great job at softening the skin in those areas. I also used it on my husband's foot to ease the sting of an insect bite, which felt like it was burning the skin and it immediately soothed the skin and eased the itch. It's one of those products that all households should have as it has a multitude of uses. £23. I started this post with my favourite product from the brand and I'm ending with my second favourite. The Firming Serum Capsules are described as being a natural alternative to botox. You twist off the top of the capsule to reveal the serum inside. This serum feels silky and absorbs pretty much immediately upon application, which is followed with moisturiser. I have been using this as a nightly treatment and whilst I don't know if I could say that I look like I've had botox, my skin looks plump and fresh and feels supple and bouncy to touch. I'm intrigued to see what the results will be when I finish the full 60 day course. £43. This brand is now available from Cult Beauty and Feel Unique, and will be in store in Skinfull Affairs in Dublin soon. Are you tempted to try any of these products? I'd love to hear! Now on to the giveaway! You can win all of the products that I have mentioned in this post! The rules are simple. There are 5 mandatory steps - all of which are detailed in the Rafflecopter widget below. You must follow Beautylymin on Bloglovin, Twitter and Instagram, you must also follow Ecooking on Instagram and you must tweet the giveaway link. All of the links are in the Rafflecopter widget. If you leave any section empty or with NA, your entry will be deleted and if you follow/unfollow, your entry will be deleted. The giveaway will end on October 5th at midnight and the winner will be chosen via random.org. I will then contact the winner who will have 48 hours to respond to my mail. If the winner does not respond within 48 hours, they will be disqualified and another winner will be chosen. If you are under 16, you must ask the permission of your parent/guardian to enter as you will have to disclose your address. This giveaway is open to residents of Europe only. There is no cash alternative or substitution available. Best of luck!